June 5, 2017 This post may contain affiliate links. THINKING ABOUT STARTING A MOM BLOG? 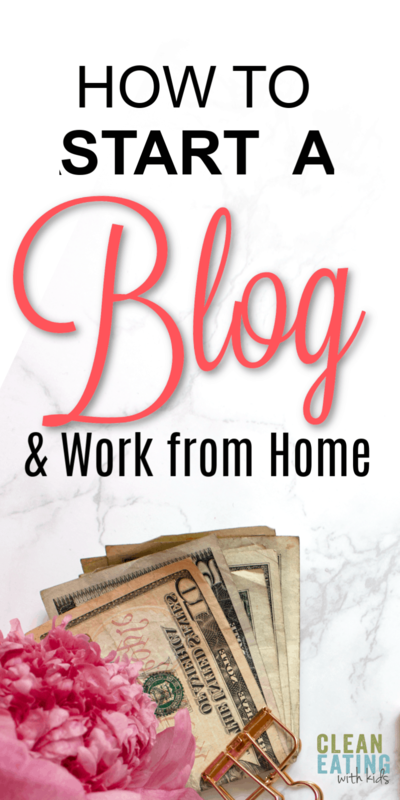 Maybe you’ve heard that you can make money by starting a blog and you really, really want to work from home. Maybe you’re just looking for a way to earn some money on the side or a full time income. Either way, blogging is a way to do all of this. And it’s only recently that I started actually believing this! The 5 Things I did to get my Blog Earning $1000 per month. OK, so this is that ‘How to Start a Blog in 10 minutes’ post that most Bloggers have on their site. And let’s face it, if it were that simple, every single blogger would be making thousands of $$$ every month. But they are not. Only 10% of bloggers make over $1000 a month from their blog. So, if you are a Beginner Blogger, before you go ahead and follow this tutorial, please read this first. Blogging is NOT for everyone. Right, Now. 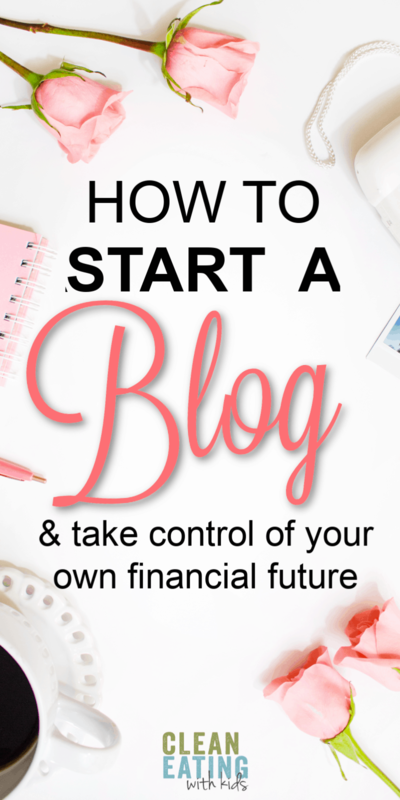 If you are ready to start your Blog (armed with the truth about blogging), then let’s go girl! Make it easy to type and spell. Stick with letters. Avoid numbers, hyphens and other symbols. Keep it as short and simple as you can. Try and include keywords in the name if possible (this definitely helps with SEO in the short term, but it’s not a deal breaker). Pick a name that looks OK when typed in the address bar. Make sure it doesn’t spell out something obscene. Choose a domain name that will grow with you. When I chose CleanEatingwithKids.com, I didn’t take into account that I would be blogging about more than just clean eating. I’ve thought about changing the domain, but haven’t quite made the decision on it. When you decide on a name, go and secure it now. Don’t wait a week. Chances are it will be gone. Even if you decide to choose another one later, at most you would have lost a couple of dollars. Research. Aside from checking it’s availability, search to see if there are other companies with a similar name to you. Make sure the name you’ve selected isn’t trademarked, copyrighted or being used by another company. It could result in a huge legal mess that could cost you a fortune, as well as your domain! –>> You can click here to check if your domain address is available to register and let’s start your blog right now. If a domain name is the address of your business, then think of hosting as the property itself. It’s where you are going to build your website. Choosing a secure, reliable hosting provider is vital because it’s the foundation of your business. I’m not going to waste time convincing you that you need to pay for hosting, because it’s a no brainer. If you are going to have a profitable blog you need to OWN your blog. The problem with ‘free’ hosting providers is that you never own your blog. You will need to get your own little piece of the internet. Think of it as paying rent. And at $3.95 a month, it’s the cheapest business rent you can hope to get too. If you’re in any blogging groups or have any blogging friends, you ‘ll most probably already know by now that Siteground has become the new favorite by many bloggers. And for good reason too. Siteground has an awesome support team that can be reached 24/7, highly dependable fast speed, and amazing security that will keep your site protected. I’ve tried a few hosting providers in the past. I started with Bluehost, but switched a year later to Siteground after a late night coding error I had made messed up my entire blog. Seriously! I panicked when all my posts vanished in an instant. It wasn’t Bluehosts fault, but they couldn’t help me. At 3am, I contacted Siteground after reading a review about their 24 hr support. I knew that they would have someone online. They helped me launch a backup (even though I wasn’t even a customer yet) and 15 minutes later my blog was back. I changed hosting providers that night and have never looked back! I’m not an Tech person. I just want to be able to write and not worry about the website stuff. If you a little bit tech unsavvy like me, then I cannot recommend Siteground enough!!! They are amazing!! Hosting my blog with Siteground is the best move I ever made. They hold your hand through the entire process (when I say this, I mean they did it for me while I was on chat with their technician). –>> Click this link to purchase blog hosting with Siteground, it will open in a new window. 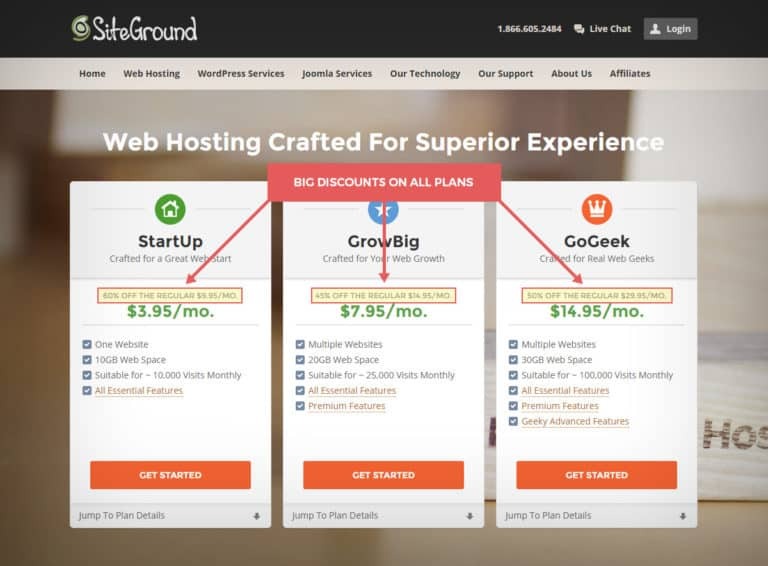 Siteground has three hosting plans. I recommend the StartUp plan when you are just starting out. This plan is more than you will need for a new blog. It can handle up to 10,000 unique visits per month (I was on this plan up until 30,000 visitors and it was perfect!) and it comes with a one click WordPress install (EASY! ), free daily backup (You will NEED to backup your site. I used to pay an extra $12/month for this service but it’s included with Siteground for free), and BRILLIANT customer service. ** BIG DISCOUNT ** The regular price $9.95 per month, But you can get it for 60% off ($3.95/month) through this link! Without complicating it too much, WordPress is the software that you use to write your blog. It’s how we display our words and images to our readers. And if you’ve decided to go with a good hosting provider like Siteground (and I’m hoping you’ve trusted to go with my recommendation on this one), then this part is a breeze. Siteground makes it really easy to install WordPress. Their support team is ready to install WordPress for you at no cost. After you purchase your hosting, the next page will show you how to install WordPress or SIMPLY CONTACT SITEGROUND SUPPORT VIA CHAT AND HAVE THEM WALK YOU THROUGH INSTALLING WORDPRESS ON YOUR NEW DOMAIN. If you run into any problems, Siteground will install it for you. All you have to do is contact them using the huge “Our Support” tab on Siteground. And you get to see first hand why I say their service is so flippin’ amazing! Type in www.yourdomainname.com/wp-admin. Your Siteground Technician would have installed WordPress on your site and given you your login details to get your started. This is the bit that can get you unstuck. Don’t obsess for too long over the ‘look’ of your website. Decide on a clean, easy to navigate theme and move as quickly as possible to crating your content. Your theme is what your website will look like when someone visits your blog. It’s how your colors, logo, images and fonts are arranged. I use the Genesis Theme and Foodie Pro Framework. I then hired a Web Designer to customize my fonts and help me with my colors. CHEAT TIP: There are tons of affordable and creative WordPress themes through Creative Market, BUT (and this is a huge money saver), if you head over to Fiverr.com, you can get a developer to install a WordPress theme for you and save yourself the headache and a bucket load of cash. If you are installing your Theme yourself, then once you choose your theme, you’ll want to watch the video below and follow step by step. Get Excited because you are officially an owner of your very own little piece of the internet! This is your place to create, inspire, add value and earn an income! Unfortunately, if you want to make money from your blog, you will need to commit to some extra learning. Over the past 2 and a bit years I have spent way, way too much money on blogging courses and ebooks, in the hope that they would be the ‘one thing’ to take my blog to the next level. I have found some courses to be more than worth the money I paid whilst some of them were a complete waste of my time and cash. How I Went From 17k to 400k Monthly Page Views in 9 Months – This Traffic Transformation eBook is one of my favourite blogging resources. It includes 21+ strategies that are easy to implement and you can start to action immediately to dramatically increase your page views. 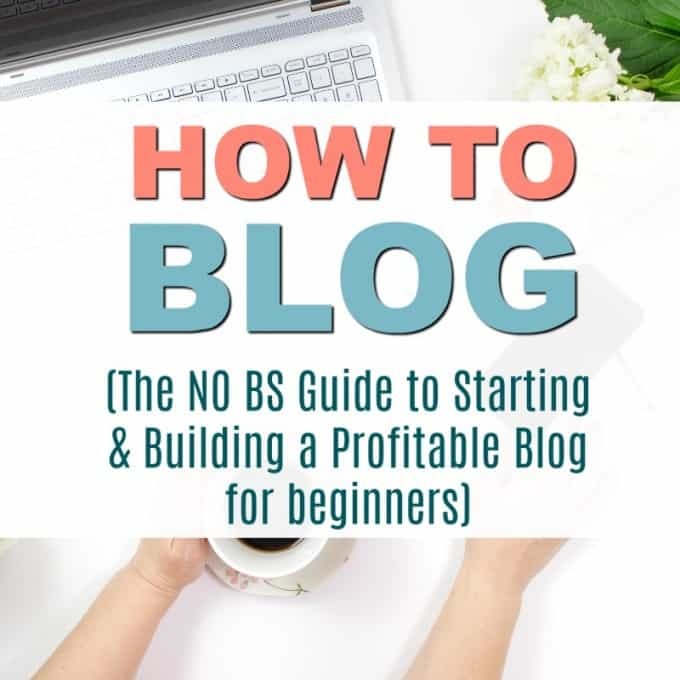 If your page views have plateaued, decreased, or you’re simply ready to take your blog to the next level, you need to read this eBook. There’s even a free trial for the ebook so you can test it out first. Trust me, it’s worth it! I keep a copy of it in the front of my blogging binder for easy reference. Making Sense of Affiliate Marketing. Affiliate Marketing is your blogs bread and butter. Michelle makes over $50K a month from affiliates so she knows her stuff! You get absolutely everything you need to know about affiliate marketing from a 7 figure blogger. The course also gives you access to a private Facebook group, which in my opinion, is worth the cost of the course alone. Michelle answers your questions directly (which is kinda cool). Pinteresting Strategies. This little ebook is a game changer. Carly nailed it with this one! Her manual pinning strategy is a big reason that my Pinterest Profile now gets between 1.6 – 2.1 Million Views every month. I’m pretty sure that you know by now that Pinterest is the #1 source of traffic for new Bloggers. It’s imperative that you implement a Pinterest Marketing plan from the start. Carly’s strategy provides a solid foundation to consistently grow those page views. If you’re expecting to start your blog and retire by next Tuesday, then I’m probably not the Blogger to help you. If, however, you are ready to roll up your sleeves and build a profitable blog for real – then get my step-by-step e-course for Beginners delivered to you over the next 7 Days.